If flower arranging is something you have often thought about developing but never tried before, please do come along and watch what we do. You will learn very quickly and have something beautiful and ornamental to take home as well! If, on the other hand, you have had some experience of flower arranging in the past, we would be delighted to see you as there is going to be lots of creative work to do and the more members we have the merrier. We meet on the first Monday of each month. If there is anything you would like to know about the Flower Guild, please don't hesitate to contact George Madden at 90 599988. You can then carry the idea further by making the arrangement all one type of flower, such as roses (monobotanic), or use all one colour palette, such as a range of pinks (monochromatic) for a very sophisticated and modern look. If you're buying daffodils, remember that they emit latex from their stems when cut and this can shorten the life of other flowers. It is possible to leave daffodils in a bucket overnight after they have been cut and then mix them with other Spring flowers, but I think they are particularly lovely when a fairly large bunch is cut to the same length and then just set into a square glass tank container. Daffodils and tulips like to be placed in cold water. In general though, most flowers prefer water that is luke-warm as there is less oxygen in it and it helps prevent air bubbles in the stems that will block water uptake. Slightly warmer water can also encourage flower buds to open. If you're trying to hold back an arrangement for a particular occasion, however, colder water and a cooler room will help the flowers stay fresh longer. 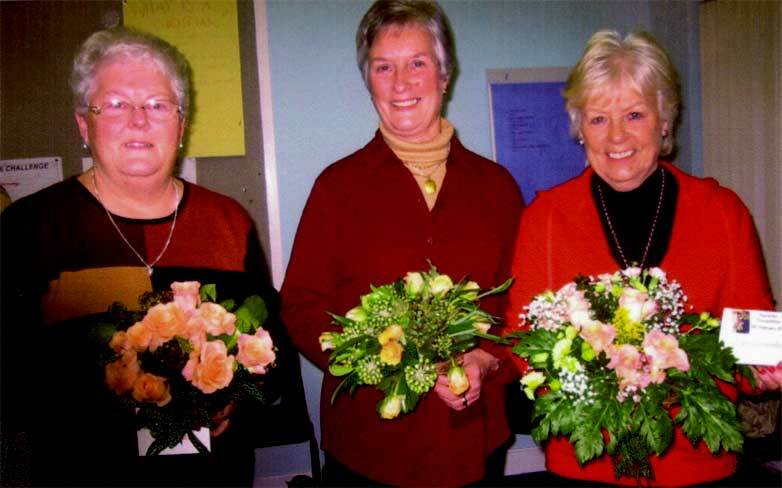 Mossley Flower Guild has been running since 1999. It is led by George Madden who is a very talented and internationally recognised flower arranger. He regularly gives public demonstrations both in Ireland and the mainland. We meet usually once a month to try out different styles and sizes of arrangements. Each session begins with a demonstration by George of what we will be practising the following month. That way we know exactly what to bring and how to copy what we have been taught. We then do some arranging ourselves and, when everything is tidied away, we sit down to a nice cup of tea and biscuits and have a lovely relaxed chat, while at the same time admiring our work. We have a standard charge of £1 per session. This sum covers refreshments, expenses and any extra flowers needed occasionally for the church pedestals. During the year, when requested by parishioners, we take turns to arrange flowers in the church itself. This is by no means compulsory for members of the group but does give those who would like the challenge the opportunity to do something a little more advanced.